350 Bay Area is made up of a dynamic team of volunteers who not only help do the work, but lead the initiatives as well. 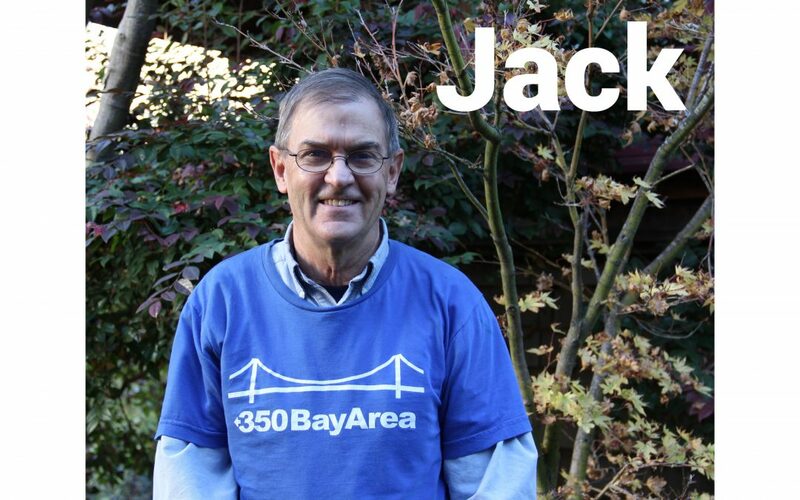 One of these awesome activists is Jack; read about his work and passions below. Climate chaos will cause untold human suffering. Plus, it threatens civilization itself–thousands of years of music, art, culture and human striving to build a better world. We could lose it all. Transportation, Fundraising (I’m the treasurer), and organizing for events like RISE and other marches and rallies. I was excited by AB1745 which would have banned sale of fossil fuel vehicles as of 2040. The bill didn’t clear its house committee this year, but we are strategizing how to bring it back next year or in 2020. We would also like to move that date to 2030, but we agree that the 2040 date gives us a toehold. Related to this effort to eliminate fossil fuel vehicles, I started a blog “solarpowerelectriccars.net” in 2011, but I haven’t had time to work on it lately. Transportation engineer (25 years for the City/County of San Francisco–retired in 2010), bookkeeper, preschool teacher, truck assembler, and community organizer.